Wedding Videographer Dublin – Rosaleen and David – 7’th July 2012. 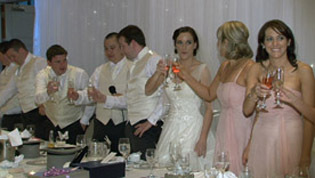 I was the official wedding videographer at the wedding of Rosaleen Lawlor and David Taylor on the 7’th July 2012. The church was St. Patrick’s in Kilquade and it dates back well over a hundred years and is a very quaint country church, it was all the more special because David’s uncle Dennis was the priest marrying them. The beautiful church music was provided by Mary Mc Cague, the music really added to the atmosphere of the ceremony, the mass booklets were out of this world and were done by Ivy Ellen. 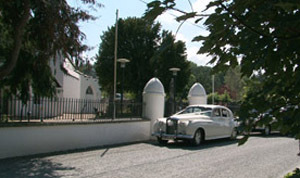 Rosaleen arrived in style and looked stunning, the wedding car was a vintage Rolls from Connolly Chauffeurs. The wedding flowers were beautiful and done by Declan from Vavasseur Fleur. The wedding photographer was the fabulous Susan Jefferies she is well know and has a very different approach to wedding photography and is well respected in the wedding trade. The wedding reception was held in the magnificent Druids Glen were Nessa Karney and her brilliant team were ever so attentive and there to cover your every need, the room was laid out spectacularly. The wedding cake was stunning and was made by amazing cakes. In the evening the music was by the wedding band Harlequin they are a brilliant band and they have a way with the crowd to keep them on the floor. I will be meeting up with Rosaleen and David again soon when their wedding DVD’s are ready. 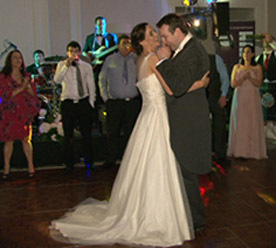 Next PostWedding Videographer Dublin – Martina and David – 23’rd July 2012.